That is the comment from Father Martin Powell, rector of the parish, after he said St Mary’s, Barnham, was subjected to its fourth break-in in just four weeks on Monday. 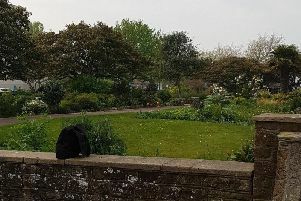 Gardening equipment is among the items taken during the ‘minor thefts’, which have also seen windows smashed and a church wall safe damaged. Martin said St Mary’s is not alone either, reporting that property at St Mary, Aldingbourne, has been broken into and that other churches targeted include Binstead, Yapton and Birdham. “Thankfully nothing of value has been taken from the church – indeed nothing of material value is stored in the church – and so the loss is minimal,” he said. Adding his thanks to the police for its assistance, Martin said all local churches are being extra vigilant and appealed for public help. A spokesman for Sussex Police asked anyone with information to report it via sussex.police.uk quoting serial number 833 of 20/5.